Osiris Aristy, 17, was arrested in Bushwick this week after posting a status that depicted gun emojis next to cop emojis. BUSHWICK — A Bushwick teen was arrested Sunday after posting several Facebook statuses threatening to kill police officers — partly in the form of several gun emojis pointing to police emojis. Osiris Aristy, 17, was arrested on Jan. 18 around 2:46 a.m. at his home on Wyckoff Avenue near Himrod Street for making terrorist threats, criminal possession of a weapon, criminal use of drugs and criminal possession of marijuana, according to the NYPD and prosecutors. Police received an arrest warrant from District Attorney Ken Thompson's office after routine Facebook monitoring found that Aristy had posted selfies with guns, selfies with marijuana joints and statements made with emojis threatening to kill cops, according to the DA's office and 83rd Precinct Inspector Maximo Tolentino. At 9:52 p.m. on Jan. 15, Aristy posted a photo of him with a revolver and rounds of ammunition with the caption "feel like katxhin a body right now." Shortly after, Aristy posted "N***a run up on me, he gunna get blown down,' followed by an emoji of a police officer with three gun emojis pointed at it, according to a criminal complaint. And at 11:05 p.m., Aristy posted "F**k the 83 104 79 98 73 PCTKKKK," followed by the police officer emoji with two gun emojis pointed at it, the DA's office said. He then wrote "U know how I rock skrap." "As a result of this conduct, the defendant has caused informant and other New York City police officers to fear for their safety, for public safety, and to suffer alarm and annoyance," the criminal complaint says. 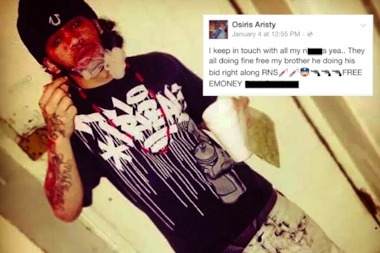 Aristy also posted a photo to Facebook on Jan. 17 of him with a gun and a marijuana blunt sticking out of his waistband, with the caption "'.38 on me I do hits in my tims." When police went to arrest Aristy on Sunday, they found a .38 caliber Smith and Wesson firearm in his bedroom and more than 25 grams of pot in his living room, according to a criminal complaint. The weed was packaged in 21 Ziplock bags, the complaint said. Aristy's bail is set at $150,000. His next court date is Friday. His attorney Fred Pratt had no comment on Aristy's weapon or weed charges. But he said that his client's Facebook posts did not constitute "an actual threat" against the police. Many people on Facebook use the gun emoji next to the police emoji, Pratt added, and that doesn't mean they're actually threatening officers. "I understand that people found what he said distasteful and uncomfortable," Pratt said, "but he never threatened to take action against police." Tolentino told locals at a Bushwick Community Board 4 meeting Thursday that Aristy "was not a good guy" and had already "targeted this community on numerous occasions." Police said Aristy had 12 prior arrests, including for robbery, assault, criminal possession of marijuana, disorderly content and criminal possession of a weapon. In October, Aristy pleaded guilty to robbery in the first degree after he attacked people on two separate occasions in robberies, first with a beer bottle and then with a knife. On May 18 around 4:45 a.m., he and five others repeatedly struck a man with beer bottles before taking his cash and cell phone, on Greene Avenue near Wyckoff Avenue. The victim suffered dizziness, bleeding, cuts and bruises to his face, according to a criminal complaint. Then on May 27 around 3:00 a.m., he and another person placed a knife to a man's neck, knocked him to the ground and then took his cash and cellphone, according to a criminal complaint. His plea deal included a promise of six months in jail, which he already served; five years probation and a court-mandated program involving counseling, drug testing and school monitoring, according to the DA's office. The conditions of the deal may change at his next court date for the robberies on Feb. 20 due to the terrorist threat charge, according to the DA's office. Aristy's attorney did not have a comment on the previous charges. Tolentino emphasized that any posts to social media would be taken very seriously. "You make a threat on the internet, we’re going to be watching," he said. "We are going to attempt to prosecute to the fullest extent of the law."